Pricing below is for one subject. •Prices are for one subject. •The artist may be able to work from your photographs if they are sharp and clear. •Please contact artist for prices and availability of Off the Wall paintings. •For each additional subject, add 70%. •Prices do not include framing, shipping, or travel. • If a photo session is required, client is responsible for all travel expenses (nonrefundable). •Deposit of 30% required upon approval of pose, with balance due upon approval of finished portrait. •Your portrait is guaranteed: if you aren't completely satisfied, you will owe nothing above any travel expenses incurred for your portrait's preparation. •The egg shown in the Off the Wall section was chosen to represent the state of Georgia in the 2001 White House Egg Display. Each year artists from each state and the District of Columbia design and decorate eggs to be shown in the White House. It is decorated in the ancient Ukrainian style, using a wax-resist method and a series of colored dyes. I was greatly honored to have my design chosen for that event! 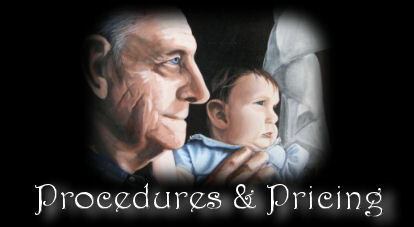 Acrylic portraits of people will be done life-sized; canvas dimensions will vary by pose and number of subjects included. Pricing below is for one subject. Pricing below by canvas size and one subject.